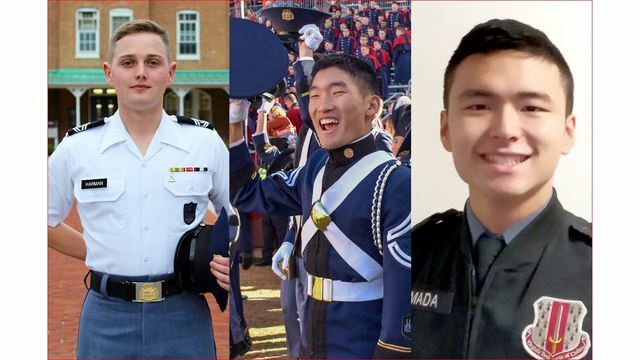 Blacksburg, VA - -- Three members of the Virginia Tech Corps of Cadets Color Guard — cadets Austin Harman, Calvin Muramoto, and Erik Yamada — will receive the flags at the Dec. 31 Military Bowl. The color guard will participate in pre-game activities, and the corps canine ambassador, Growley II (call sign “Tank”), also will be in attendance to represent the regiment and cheer on the Hokies. The corps and the Virginia Tech football team continue their proud partnership to highlight the colors during the pre-game ceremony at every football game. Harman is a junior majoring in geosciences in the College of Science with minors in history and leadership studies. He is the recipient of a corps’ Emerging Leader Scholarship and in the Citizen-Leader Track. Muramoto is a junior majoring in computational modeling and data analytics in the College of Science with minors in Japanese and economics. His is in Air Force ROTC. Yamada is a junior majoring in mathematics in the College of Science with a minor in leadership studies. He is the recipient of an Emerging Leader Scholarship and in Air Force ROTC.